My planned stop tonight as I have 4 days to Vienna 200 km distant, calculating out at 50 km a day. 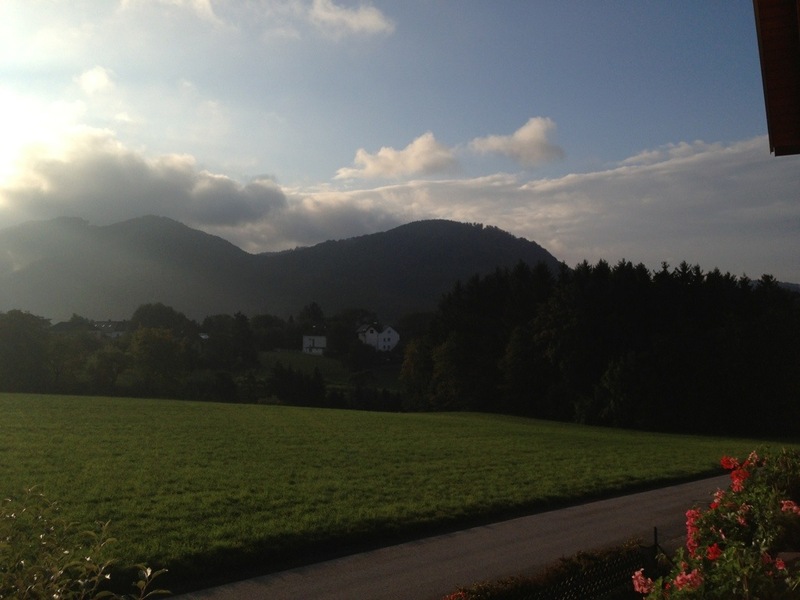 I booked into Haus Kloibhofer, a private bed and breakfast. The house is situated on a hill behind Grein. This is one very delightful village! It is nestled into a bend in the mighty Danube. It is an ancient settlement, mentioned in documents in 1147. It was a major stop/port in days bygone. It was, as many of the settlements along the river, in its heyday, a wealthy district. The reason is that it is situated on a sweeping bend in the Danube, considered to be one of the most treacherous passages. Rocks, whirlpools and eddies are obvious even to me today. This meant that ships and barges required a local navigator to embark and guide the vessel safely around the bend! They charged like wounded bulls or insert your own better simile or metaphor. I was met, as I puffed and panted up the steep incline, by a grandmotherly woman in boots sweeping the footpath. We rapidly established that she was the proprietor, presumably Madam Kloibhofer and that I had a booking! She fussed and I suspect became a little agitated, over my rain and mud splattered bike, panniers, shoes and clothing. Indeed she indicated the garage where I had to park the bike and she promptly began to clean my panniers with an old towel. I had visions that she may resort to hosing me down personally! She then become even more agitated when I admitted that there was only one person, namely me! How could this be when I had specified a double room with my Internet booking. My attempts to explain to Madam Kloibhofer that the web site offered Hobson’s choice – one remaining double room when I booked, were futile. 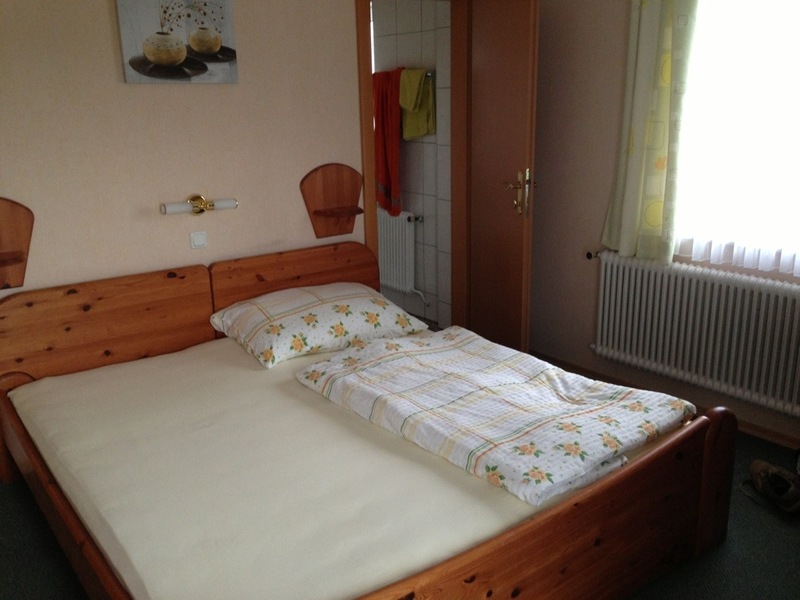 I had the distinct feeling that she eyed me with suspicion, convinced that between Linz and the Kloibhofer Bed & Breakfast, I had done away with my wife. She reminded me of one of the best cleaning women I have ever employed! A fearsome obsessive Dutch woman, the sort of cleaning person who frightens you so much that you actually clean up the house the night before she arrives! What reinforced this conclusion was that as soon as I had clomped my way into the house, up the stairs and into my room, was the commencing noise of a vacuum cleaner! The activity persisted for all the time that I took to settle in, shower and dress to go out and explore! If cleanliness was next to Godliness, she was on his right hand, I thought! I cautiously ventured out and down the stairs, fearing retribution for spreading dirt again. Imagine my surprise when I came across what can only be described as a robotic Dyson. It was the land equivalent of a pool vacuum cleaner. I teased it by standing in the hallway directly in its path. It ignored me, attempted to brush my shoes then did an about face and headed off in the opposite direction. Prizes will be awarded for the most creative ideas! The sun was shining this morning! …. For about 20 minutes! Great blog! I’m currently eating my way thru the south of Spain wishing I brought my bike. Saw the highest point in Spain today – 3000+ metres elevation. Makes Lofty look like a mole hill! Tough if you decide to share the bed! It was added evidence of her almost neurotic obsessive nature that once she had established that my assumed uxoricide was beyond doubt and that my dead wife was not to rise up from the depths of the Danube, that she whisked away the second doona and pillow.